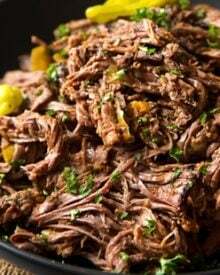 Tangy, slightly spicy Italian beef is slow cooked all day until it’s fall apart tender, and then shredded. Perfect on it’s own, on a bun, or a baked potato! 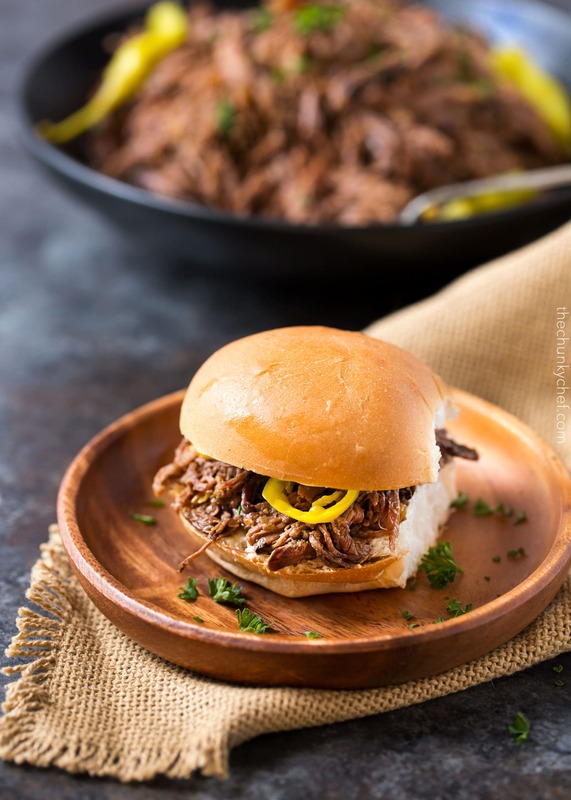 If you’re looking for a great no-fuss meal, you have to try this amazing Slow Cooker Shredded Italian Beef! It cooks away in your slow cooker (hello easy weeknight meal! ), until it’s so tender it practically falls apart by itself, then shredded. 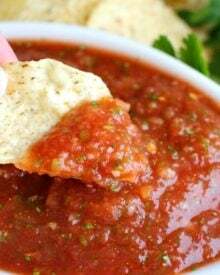 It’s tangy, a little bit spicy (totally customizable though), and SO versatile! Even though the weather may be getting warmer, I’m still a huge fan of using my slow cooker. Think about it… this way you don’t have to heat up your kitchen by having your oven or stove top on, plus, dinner practically cooks itself! 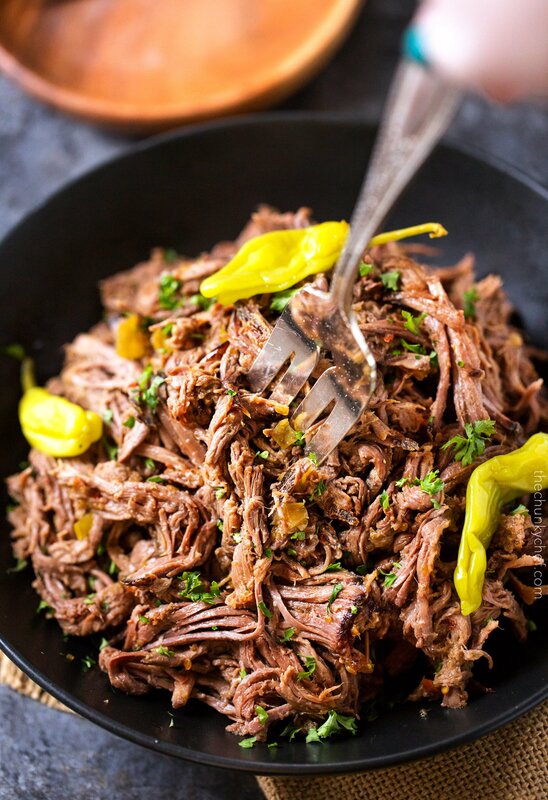 This Italian beef is unbelievably easy… you don’t even have to sear the beef first! Of course you totally can, if you have the time and feel like it. About half the time I make this beef I sear it, and the other half I skip it. Sometimes, it’s more work than I feel like doing lol. 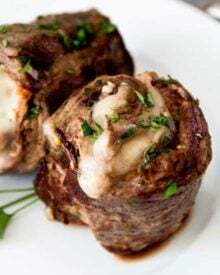 I like to use an English cut chuck roast for this (just because of the great marbilization and I like the relatively flat cut), but feel free to use your favorite cut of beef that you usually use for a roast. Have you heard of the famous Mississippi Pot Roast? This Italian beef is fairly similar, except it uses no packets full of additives. You just add your seasonings and chopped peppers to the bottom of your slow cooker and stir in the vinegar. Add your beef on top of that, top with some extra peppers and a few tablespoons of butter. Pop a lid on the slow cooker and cook on low all day. Easy as pie!! I actually have another recipe using this Italian beef coming up next week… so stay tuned for that… you definitely don’t want to miss it! Can’t you just imagine sinking your fork into that bowl full of succulent beef?! 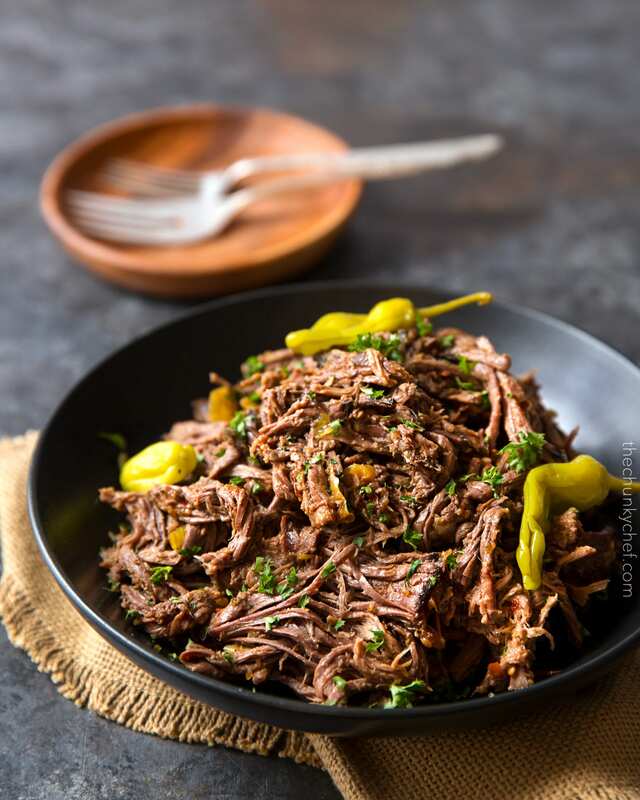 The next time you’re craving some comfort food on a weeknight… whip up this Slow Cooker Shredded Italian Beef and prepare to fall in love!! 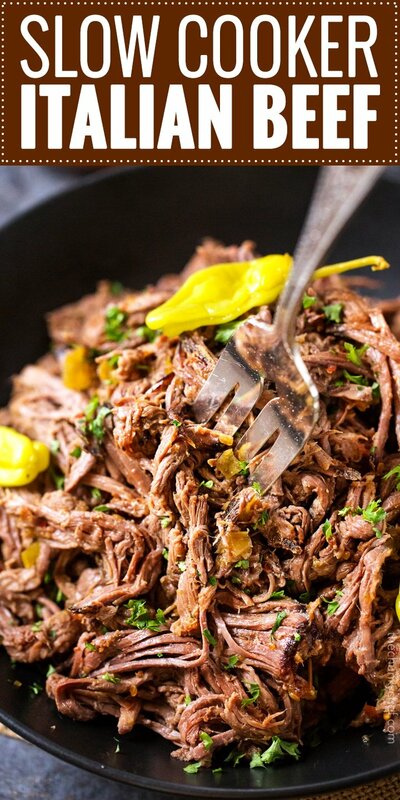 Want to try this Shredded Italian Beef? PIN IT to your SLOW COOKER or BEEF board to save for later! Tangy, slightly spicy Italian beef is slow cooked all day until it's fall apart tender, and then shredded. Perfect on it's own, on a bun, or a baked potato! Spray slow cooker insert with cooking spray. Add vinegar, dried onion, garlic powder, red pepper flakes, chopped pepperoncini peppers, and banana pepper rings to bottom of slow cooker. Stir to combine. Add beef chuck roast on top of spice mixture, season both sides with salt and black pepper. Top with butter. 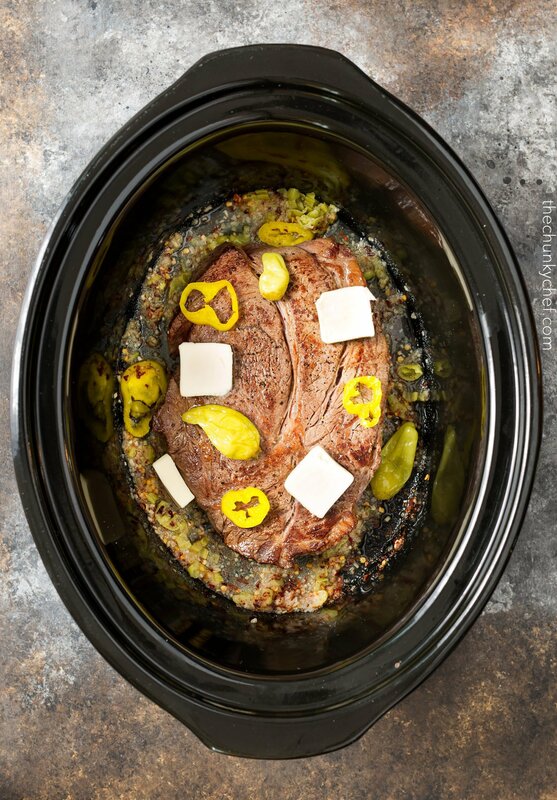 Place lid on slow cooker and cook on LOW for 8 hours. 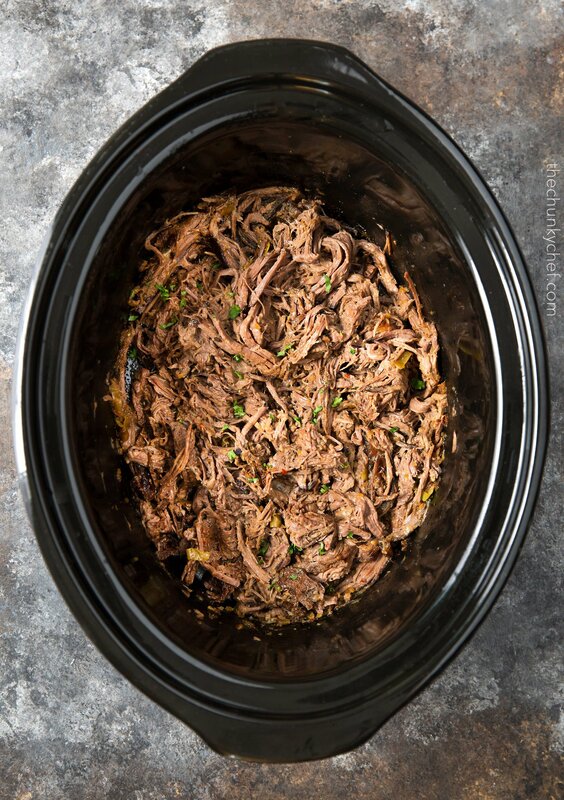 Remove beef from slow cooker and shred. 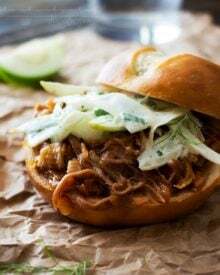 Return to slow cooker to soak up any residual juice and serve. For extra flavor, place some whole pepperoncini peppers and banana pepper rings on top of beef before cooking. If you think this garbage is remotely relate to real Italian beef, you shouldn’t be allowed to eat anything but pet kibble out of a bag, let alone be allowed in a kitchen. 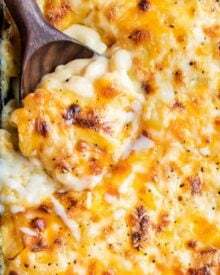 Hi there I’m making this tonight! Do you have listed any other macros besides calories? Thanks! 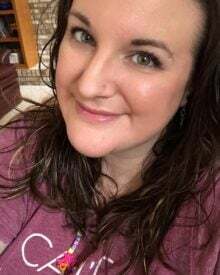 As I’m not a nutritionist, I don’t provide full nutritional information for my recipes (don’t want to inadvertently pass along incorrect information). Your best bet would be to copy the ingredients into your favorite online nutritional calculator. Could I make this a day ahead and reheat in crockpot? Absolutely! When reheating, you might want to add a little beef broth so it doesn’t dry out though. Ever used this recipe in an instapot? How long does it take to cook if so? Hi Cody 🙂 I haven’t tested this one in my instant pot yet, so I can’t say for certain, unfortunately. If my roast is 5 lbs., should I double the spices??? Hi Patricia 🙂 I would either double all the ingredients, or 1.5x the ingredients, so it has the same flavors. This was super easy and delicious! Thank you for the idea! I made this and it turned out fantastic! Slightly spicy and so flavorful! I also had leftovers for the week which is a win! I’ll definitely make this again soon. Hi Kathleen, I’ve never not made this in a slow cooker, so I can’t guarantee the results…. but I would bake it at 275 in a dutch oven for about 5 hours, or until very tender and easily shredded. I tried it – everyone loved it and wanted more of it. My only concern is the quantity of beef. I would seriously almost double the quantity of beef for 8 servings. This was delicious! I used red wine vinegar since that’s what I had and I added some dried Italian herbs just because. I eat low carb/keto, so I just reheated it over low heat in a skillet, melted some mozzarella/provolone on top and served it with a side of roasted broccoli. So so good and super simple to make. Definitely adding this to my meal rotation. I made homemade potato chips, and served them with this pulled beef, homemade guacamole and sour cream. 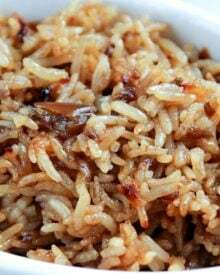 (I edited this recipe for my children’s mild taste-buds – lots of capsicum instead of the multiple chillis, with a sprinkle of dried chilli flakes). It was delicious – a healthy version of nachos. My three children and hubby absolutely devoured this meal. I will definitely make this again as an easy midweek meal. Made this today and it was awesome! Served it on fresh bread I had made and the whole family raved. 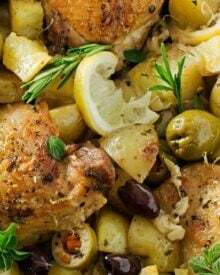 Thank you for sharing this recipe and I look forward to trying more that you have posted. Hi Genie 🙂 Oh yes, you could absolutely do that! This looks So good! Would be perfect for busy weeknights!! That looks so good, pass me a sandwich please! Anything in the slow cooker is a-ok with me! I LOVE this! Such a great idea! I looks and sounds incredibly delicious! This is a great weeknight dinner! I love this technique for cooking a roast! I have never tried the baked potato! Such great idea!